I was born and brought up in Nigeria and have been in Hyderabad for the last 21 years. Being a creative person who likes to do interesting and challenging work; I got into Interior Designing and later into Costumes, the fact is that I am not a trained Designer from any Institute. Working in the Film industry gives me the freedom to not sit behind a desk and work but to be on my toes. I would die if I have to be in one place from morning to evening for the rest of my life. I have worked in 41 films till date, a few Bollywood, but most of my films are Telugu Films. The Actors from whom I have learnt a lot are Bhumika Chawla, Junior NTR, Anushka and Manjula. I believe my best work comes if my actor, director, producer, camera person and I work as a team. I completely endorse teamwork. How did you enter in Telugu films? I was called first by the producer of “Bollywood Calling”- Satyam Garu. I was asked to work on Missamma, where I met Neelkanta and Bhumika. Missamma’s look was very well received, in so much that even today I meet people who complement my work in that film, especially the red sari. That was the start of my friendship with Bhumika Chawla and my journey in the Telugu film Industry. I have been very blessed to have good films in my kitty, such as Arundhati, Kantri, Chakram, Lakshyam, Anasuya, 16 December, Shankar Dada Zindabad, Maska, Kaavya’s Diary and many more……. 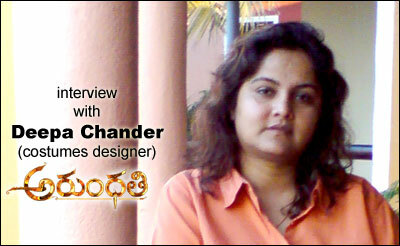 Tell us about designing looks for Jejemma character in Arundhati? Well to put it in a nut shell, I was so kicked about the project that I actually just knew immediately what the right look would be. Jejemma character in Arundhati just didn’t happen over night. I spoke to many people who have written novels dated in that era, sourced some documentaries, photographs, paintings etc. After Shyam and Rahul liked the prototype I’d made. I set about making the outfits. I can very proudly say it was all about teamwork and Shyam’s spirit to get it right. Are there any practical difficulties in getting 1920's look with costumes and jewelry? Yes, there are practical difficulties in getting the right look. The first challenge is that this look will be setting up an example to present and the future generation about the 1920’s look. The fabric used in the film for the period portion of the entire cast was very challenging; I have used real natural fiber fabric in natural vegetable dyes along with the weaving design researched and procured of that era. When it comes to Jewelry much more research went in as the designs had a very ethnic and traditional feel unique to that region. Did you take any references to design the looks? I did extensive research for the details into Arundhati’s costumes. Having a royal heritage helped a lot, along with major research in archives, libraries, my family history, other royal families’ history. With a few cinematic liberties and tweaking the look just fell into place. Tell us about your impression after watching Arundhati film? I being my biggest critic, this is the first time is all my 41 films that I have not criticized my own work. The film is really good, an excellent piece of work with regards to story, visuals, graphics, sets, camerawork, costumes…. Infact you name the department … they have really excelled. What are the memorable scenes in Arundhati in your opinion? The making of the Samadhi scene, weapon making scene and the first time Jejemma enters Arundhati. What are the other Telugu films you are currently doing?